The BiFab yard in Methil. The prospect of Fife engineering firm Burntisland Fabrications receiving no work from two major Scottish offshore wind projects has been described as an “absolute scandal” by trade unions. Unions GMB Scotland and Unite said there was a “real possibility” BiFab’s yards in Fife could end up with no work from the Moray East Offshore Windfarm and the Kincardine Floating Offshore projects near Aberdeen. The projects have a total value of £2.8 billion and Burntisland Fabrications’ new Canadian owners DF Barnes have been actively pursuing contracts from both. However, the fabrication work for five platforms supporting the Kincardine project have been awarded by procurement firm Cobra Wind International to the Spanish state shipbuilders Nevantia. Meanwhile, the Moray East project procurement firm GeoSea DEME has awarded contracts for 100 turbine jackets to UAE fabricators Lamprell and Belgian steel constructors Smulders. GMB and Unite understand that DF Barnes remain in negotiations to secure a portion of the fabrications work from the contracts allocated to both Smulders and Nevantia. BiFab sacked hundreds of workers from its yards at Burntisland and Methil in Fife and Arnish in Lewis after problems emerged in 2017. The firm, which employed 1,400 staff at its peak, was rescued from the brink of administration by the Scottish Government before being purchased by Canadian-based DF Barnes in April last year. 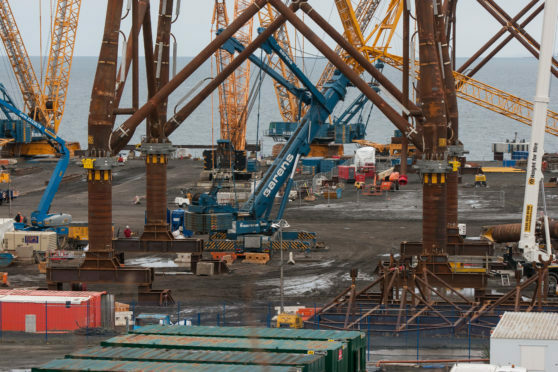 A Scottish Government spokesperson said: “We have made a long-term investment in the compan and are in regular contact with BiFab, however we do not participate in operational management decisions.